About 500 employees sacked from the Agara Sugar Factory, Ltd have started 24-hour-long protest for 12 days already. During the day time, about 600 persons gather nearby the factory and at night 30 persons stay for the night-shift in the tents. The sacked employees of the Agara Sugar Factory set up a trade union and urge the state to protect their rights from the company. “We hold protest demonstration every day, during 24-hours. About 600 people gather during the day but only 30 persons stay here in the tents during night-shifts. We request to resume functioning of the Agara Sugar Factory and to restore us to our working places. They suspended working of the factory and sacked about 500 people without any explanations. Neither the company management nor the government paid attention to us. We will not stop protest demonstrations until they satisfy our request,” Zaza Alborishvili told humanrights.ge. On March 9, another large-scaled demonstration was held in Agara, where the protesters requested to resume functioning of the factory and restore sacked employees to their working places. 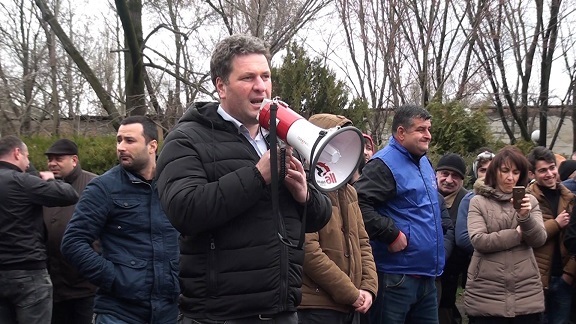 The civil activists and representatives of the Trade Union from Tbilisi arrived in Agara to declare solidarity to them. “These people have been left without work and income for six months already. 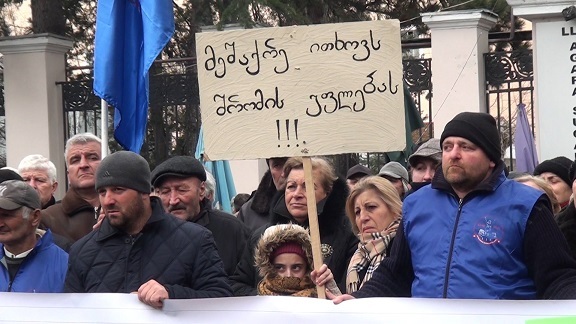 As the government does not hear their protest voice, they will move to Tbilisi,” representative of the Georgian Trade Union Giorgi Diasamidze said. Azerbaijani investor purchased the Agara Sugar Ltd several years ago and it became subsidiary company of the Azersum. Alkhan Alizade was head of the Company Agara Sugar, which suspended contracts with 481 employees in the beginning of November 2017. According to the sacked employees, the head of the company clarified their decision with financial problems of the company. Representatives of the company Azersum do not make comments with the journalists about the problem. “When we met the management of the Agara Sugar, they said low-quality foreign product is imported in the country and the Agara Sugar cannot compete with it due to low price. Consequently, they suspended the enterprise and our contracts. We are asking meeting with the Prime Minister to fix this problem. The government shall be interested to develop local enterprise, which employees about 500 persons,” Zaza Alborishvili said. The protesters said from the government only chairperson of the Parliament’s Committee on Sector Economy and Economic Policy Roman Kakulia contacted them so far but their communication did not continue and consequently they do not know the position of the Government. 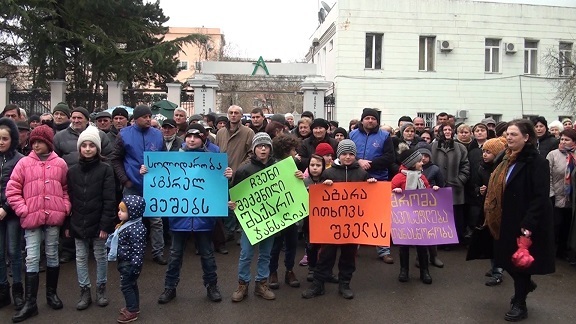 The employees of the Agara Sugar call on the Prime Minister of Georgia to get interested in their problem, otherwise they continue protest demonstrations in Tbilisi, in front of the State Chancellery.